A couple of weeks ago, the B29 Streatery truck was parked across from WDS Global near the corner of Golden Trout and Kimball in Boise. I decided to hit them up for lunch, and while I was there I noticed another truck parked a short distance down the block. While the Streatery was putting my order together, I decided to take a quick stroll to investigate. There I found something I didn't know had existed but which I've been wishing for and complaining about the lack of for over a year now: an Asian food truck in Boise. The truck is called RiceWorks. Of course since I already had a lunch order in at B29, I knew I wouldn't be able to take advantage of this new (well, new to me anyway) truck that day. Still, it was a good opportunity to scope things out. I scored a copy of their menu, and between that and a quick conversation with the man working the grill, I learned some important things. First, the prices seemed exceedingly reasonable, AND they take credit/debit cards. Think it can't get any better? Well you're wrong! They have punch cards as well, and ten purchases of $5 or more gets you $5 dollars off a future purchase. So, armed with this information (and the punch card of course), I returned a couple of days later. As I stood contemplating the options, the man doing the cooking leaned out and asked me what I wanted. I asked him what he would recommend, and he said "the most expensive thing on the menu". I guess that's what I get for answering a question with a question, but he quickly followed with a recommendation for either one of their teriyaki dishes or the Orange Chicken. In my experience, Orange Chicken is a dish that is deep fried in far too much breading and then covered in a mildly spicy but mostly overwhelmingly sweet and honey-thick sauce. It didn't seem like the kind of dish that these guys would put out considering the rest of their menu, so I was curious enough to order it. I was immediately asked if I wanted it spicy or sweet, and even though the dish is usually far too sweet for my tastes, I decided to play it safe. In my experience, if an Asian cook offers a spicy option, they usually mean it. I opted for fried rice rather than steamed, and I couldn't resist the opportunity to add an egg roll for only a dollar more. The grill man certainly knew what he was talking about. This is my favorite version of Orange Chicken that I've had thus far. The chicken itself was cut into nearly identically-sized little morsels, ever so lightly breaded and cooked perfectly with not so much as a single tough or fatty bit to be found. The orange sauce itself while sweet did taste more like orange and less like the orangey sugar gravy you find at most restaurants. The fried rice was a veggie variety with tiny pieces of green onion and carrot, and while I usually hate carrots in my fried rice I've never had them in these tiny little shreds that almost mimic the texture of the rice. It was certainly an improvement over those big cubes that look like they came out of package of mixed frozen vegetables. Most importantly, it tasted good and was not oily or greasy at all. The stir fried veggies, a mix of broccoli, onion and zucchini were also a very welcome addition (if you've never had stir-fried zucchini, I feel sorry for you) and were also cooked perfectly, firm yet tender. The egg roll was almost as much of a surprise as the Orange Chicken. Those of you who have been reading my stuff for a while may remember me professing my love for the egg rolls at Baguette Deli, but I would go so far as to say these are even better. They're the same Vietnamese style with the thin, crispy wrapper, and the fillings are similar but in different proportions. Rice Works definitely has an edge on the seasoning side, and most importantly the rolls are cooked to order rather than sitting under a warming lamp awaiting purchase. Less than a week later, I was back at the truck to try the other recommendation. I opted for Teriyaki Beef, but this time I kicked in the extra dollar for chow mein noodles instead of rice. While my food was being prepared, the owner/proprietor Phu stepped out of the truck to chat. The guy is fascinating, having eaten at, worked for or been related to people who have worked at all of the best Asian eateries in town. Seriously, go and ask him about it some time, he has a hell of a pedigree. We discussed everything from the sanitary conditions at a few places to the best options for yakisoba and the lack of dim sum. I think I may have even genuinely surprised him a few times with my tastes and knowledge, and there was even a mostly friendly debate over whether brown sweet and sour sauce actually exists or not. Even after my lunch had been handed out the window, we continued on for some time talking about the current street food scene, Mongolian BBQ joints as a substitute since there are no real ramen shops in the area, and the various Asian markets scattered around town. We were getting along so well that I slipped for the first time ever and revealed the whole blog-writing thing, something I've never done before writing a place up. He didn't make a big deal out of it though, only going so far as to apologize for the fact that my food was now going to be cold due to our long chat and suggesting that I should come back and try one of the grilled combos before doing my review. He needn't have apologized about the temperature of the food. After all, it was plenty hot enough outside, and I love cold noodle dishes and have many times eaten leftover Chinese food right out of the fridge. Even though it was no longer at peak temperature, the beef medallions were still very tender and perfectly cooked. The teriyaki sauce, much like the orange sauce, was a delicious and much thinner variety than I'm used to. If there's any issue I have with a lot of Asian restaurants, it's that they feel the need to bury inferior quality meat in breading and sauce. Here you could taste the beef perfectly well, which was a very good thing. The chow mein noodles were the soft kind, mixed with more vegetables and more light and tasty sauce. The giant pile of rice the first time hadn't been a mistake either, as this box was literally bursting with noodles and shows more of the respect and emphasis that Asian chefs place on noodles and rice. They're supposed to be a centerpiece of the meal after all, something all too often neglected because of the pile of cheap, gummy rice that usually accompanies food in Americanized Chinese restaurants. Anyway, back off the soapbox now, let me just say that this was another surprising and very good meal and further established RiceWorks as one of my new favorite lunch spots. A few days later, I stopped in yet again to try the aforementioned grilled combo plate. I knew this was already going to be a long review, but if an owner/chef makes a recommendation, I have a hard time passing it up. I chose chicken and shrimp, this time with steamed rice and a side of Crab Rangoon. I had a few more moments to chat with Phu before he went to run some errands, mostly about how he's hoping to get a customized paint job for the truck soon. When my food was done, he admonished me to eat it while it was still hot this time and we parted ways. This is one of those old standby dishes in Chinese restaurants, usually a little imitation crab meat mixed with a LOT of cream cheese before being packed into a wonton skin and fried. A look inside one of the Rangoons revealed that the method here was the exact opposite, with a generous portion of seafood being bound together by a little cream cheese. A lot of people really dig the large amount of cream cheese, and I've even seen fried wontons with JUST cream cheese inside them. As for me, I think it's safe to say I'm more fond of this kind of ratio. As I opened the container that held the main part of my meal and the aroma hit me, I knew why Phu had recommended this dish. It showcases the quality of the ingredients and preparation and the little bit of extra money does show up on your plate by way of a larger quantity of both veggies and protein. The seasoning used was superb and especially complimentary to the shrimp, and it was fun to eat different combinations of things in the same bite to see how it affected the flavor. Rice fans will also not be disappointed here, as the steamed rice was very good. I'm not certain what cooking method RiceWorks uses for their rice, but the texture and moisture level was as good as anything I get out of my $200 imported Japanese rice cooker. As long as this review is, it still feels a little incomplete to me. After all, I still have yet to sample the Sweet & Sour options, the General's Chicken, the potstickers, and the Spicy Egg Roll Sauce (I've seen a picture of this last one, it looks a little like the sauce which adorns spicy tuna rolls in sushi joints). I fully expect some of these, if not all of them, will further challenge my preconceived notions of how those classic dishes are prepared. During our first conversation, Phu told me that his truck has been on the street for a year and has a pretty loyal and established clientele, and as much as I'm disappointed that RiceWorks has been a mere ten minute drive from my office for that long without me knowing about it, at least I can take comfort in the fact that I should be able to expect them to stick around for some time to come. 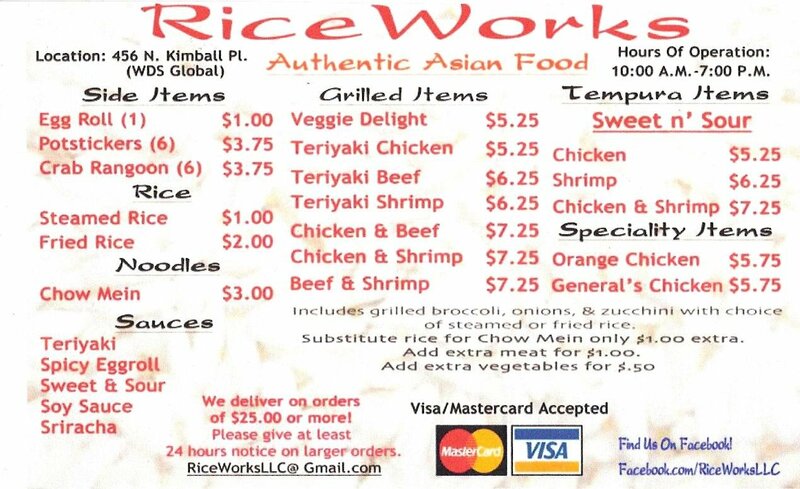 I tried Rice Works on 9/2/11. It was great! If you haven't been back since writing your review, they've since got that custom paint job and it's now the coolest food truck in town. I'd heard of mention of Rice Works in the Boise Weekly, but it wasn't a food review, just a short piece about local food trucks. It was reading your outstanding review that caused me to seek it out. I'm glad I did because it was some of the best Chinese food I've had in a long time. Everything was cooked to order using only the best of ingredients. I had the egg roll with spicy sauce (probably Sriracha and mayo) and the General's Chicken with a spice level of 3. In all fairness, egg rolls are something I eat occasionally, but they're not one of my favorite things. I much prefer the complexity of fried Vietnamese spring rolls (cha gio). Having said that, I found these blander than most egg rolls I've had in the past. I'm wondering if they put a different mixture inside of my egg roll because I requested the spicy sauce? A cross section of my egg roll revealed an evenly colored off-white mixture that lacked the varied colors and textures I'm used to seeing in my egg rolls, making me wonder what the heck was in it? Even so, I'll probably try another Rice Works egg roll before making up my mind how I feel about them, especially knowing how much you like them. I loved the General's Chicken. The first time I had this dish was in the early 90's in a place in Spokane called The China Pearl. Their version was extremely spicy, so much so that a 3 on the spice scale of 1-5 was almost too much for me, and I can take some heat. I ate it there several times and it was always spicy. Since then, every place I've tried it, I've found a heavily battered, heavily sauced chicken that is mostly sweet with only a hint of spicy. Rice Works version of this dish is similar to what I had at The China Pearl, but less heavily battered, which I liked. I liked the generous portion of rice that accompanied the chicken and I thought the addition of the stir-fried veggies was a nice touch. And the guys working the truck couldn't have been nicer. I had to restrain myself from returning the next day to try the Orange Chicken, but give me time. Next time, I'm going back with friends in tow. Thanks Track for another great recommendation! Hi - I decided to check out Rice Works today and it wasn't there. Just a taco truck... If you know where they went, please let us know. It's a hazard of the whole mobile eatery thing. What time did you go by? I don't think they open until Noon on Fridays.